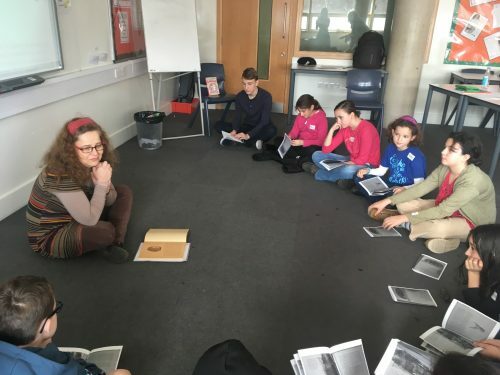 On the last Saturday before the half-term holiday, on 9th February 2019, Radka, a volunteer of the Czech School Without Borders, London prepared the first part of a series of literary workshops. Children from year 5 read with Radka a rumour called Lucká válka (Luck War) from a book Staré pověsti české a moravské (The Old Rumours of Bohemia and Moravia) by Alena Ježková and which is illustrated by Renáta Fučínová. During these regular workshops with Radka, children read aloud, talk about the books and they share their reading experiences. 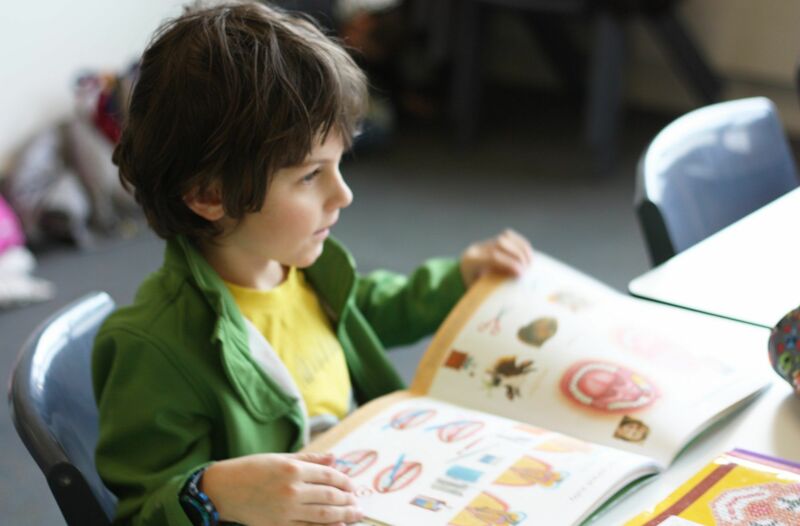 The aim of the project is to support the readership in children who can struggle with the reading of the texts for their age category because of the language. 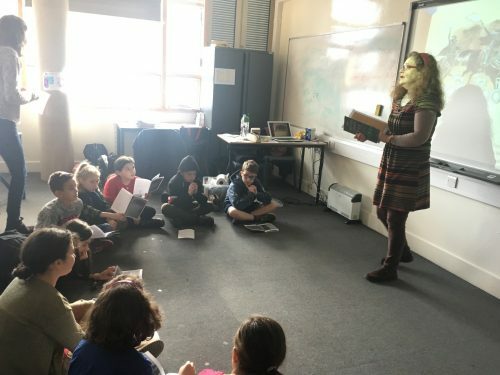 Radka always focuses on one book that is presented by her, children read an extract from it, they also discuss the unknown words and talk about the story and its lap into our lives. 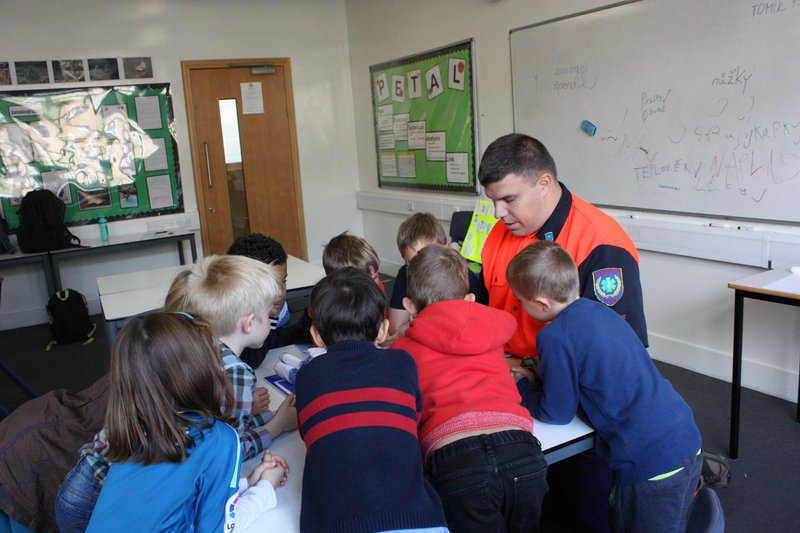 On 10th November a duo of professional paramedics from an organisation Life Rescue from Prague, Michal and Tomáš, visited our school and introduced children to the topic of first aid. 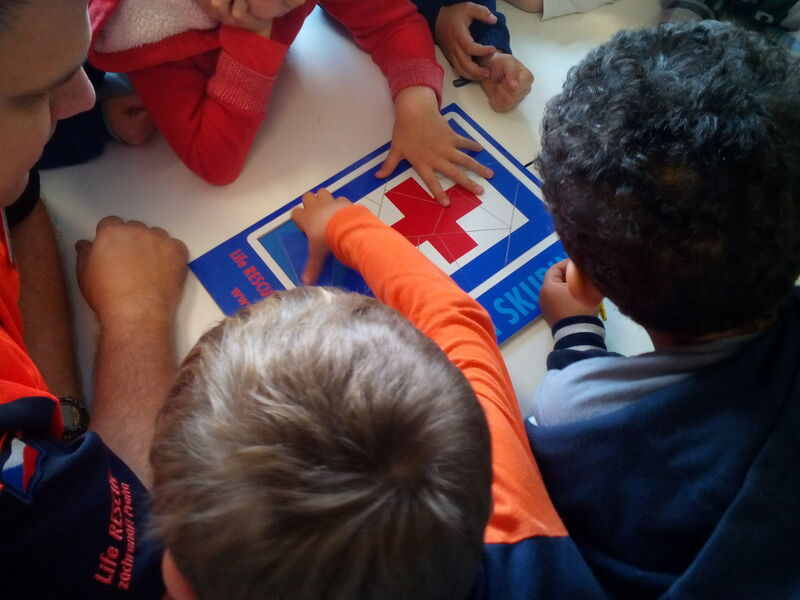 Through games, they passed basic knowledge about paramedical rescue onto the children and they all talked about which international symbol symbolises a hospital, what equipment belongs to a first aid kit and how to use a bandage. Every pupil got a badge of a young paramedic and a notebook with activities and games. When Michal, in the end, asked the kids, who want to become a paramedic the whole class enthusiastically raised their hand. 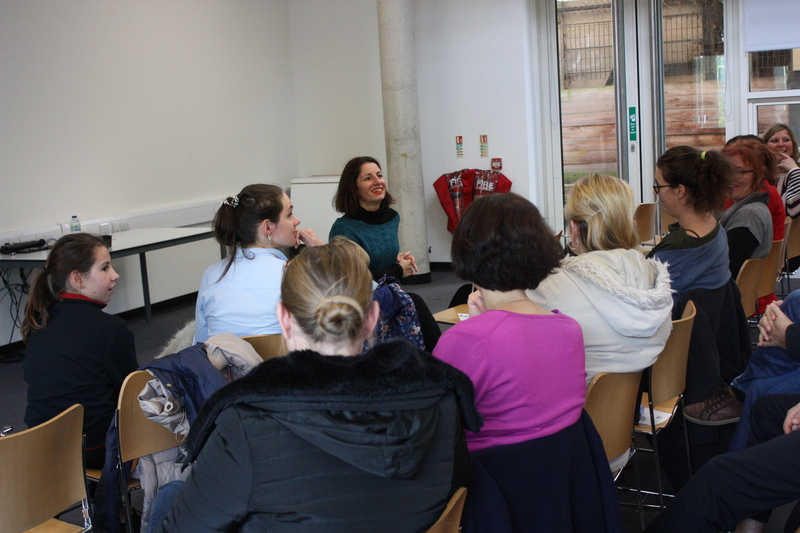 On 10th November 2018, a scientific Dr Froso Argyri, who works in a research team BiLingo at UCL that studies bi-, tri- and multilingualism, held a presentation at CSWBL about multilingualism and parenting. This was not the first time and again, her contribution was very inspiring and the following the discussion with parents (and a few kids) encouraged their parents’ and teachers’ effort in keeping up the children’s ability to speak Czech on more than a decent level. Dr Froso is a mother of two trilingual daughters herself and very often she uses her own experience and specific examples from her Icelandic-Greek-English family. downfalls and benefits of multilingualism and bi- or even a trinational identity. From the discussion, it emerged how difficult of a process cultural identification is and what problems it brings to multilingual children living in international families in London. 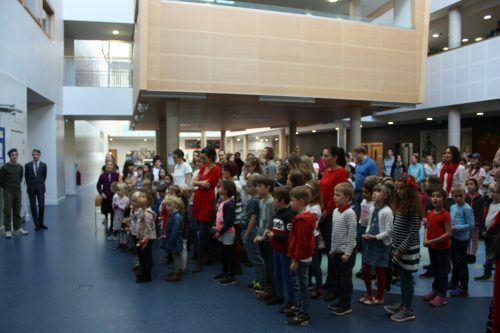 Czech School without Borders, London commemorated a centenary of Czech Republic on Saturday 3rd November 2018 during the whole-school happening in the atrium of St Mary Magdalene Academy. Before the end of lessons at 13:45 everyone in colors of the Czech flag – all children and teachers – watched a short performance. Firstly, a student of year 9, David Orsulik, in the costume of partisan from World War I reminded all historical events significant for the founding of independent Czechoslovakia in 1918. Then, the first Czechoslovakian president Tomas G. Masaryk was invited to read an original speech from 1928 when the first 10 years of Czechoslovakia were celebrated. Tomas G. Masaryk was acted by the graduate of CSWB Matyas Polensky – today a volunteer in year 5. 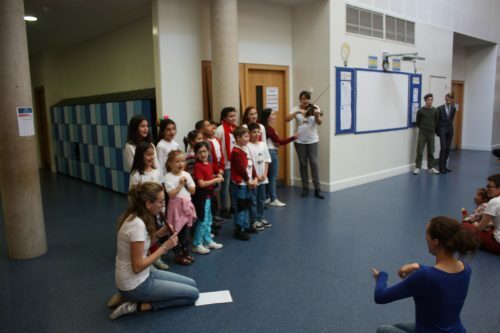 After that, children from the musical lesson called Hudební půlhodinka sang Masaryk´s favorite song Ach synku accompanied by the violet and the flute. The whole happing was concluded by the Czech anthem sung by everyone. 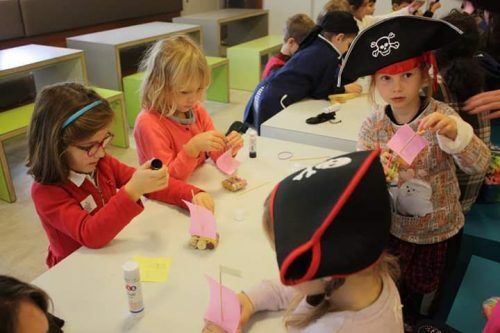 On 26th of October 2018 during the half term holidays Czech School without Borders, London organized a workshop called the Corsairs of Her Majesty for 19 children, which took place in the magnificent spaces of the National Maritime Museum in Greenwich. The event lasted from 9:30 till 17:30 and through the indoor and outdoor activities it helped children to understand better the Tudor dynasty, especially Elisabeth I and her Corsairs. After a short walk by the clipper Cutty Sark, we headed straight to the museum where children worked on one part of their worksheets. That was followed by a museum tour with a comment done by one of the interns. The children saw the record-breaking speedboat Miss Britain III, figureheads, the famous painting the Battle of Trafalgar by J. M. W. Turner or the interactive polar exhibition. After lunch, there were art and craft activities prepared. 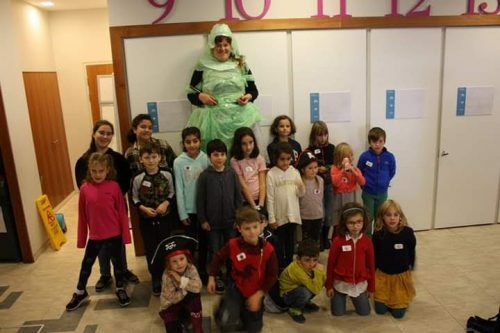 Children were creating boats from wine corks, their own pirate flags and finally, they dressed up the 4th-grade teacher Soňa who personified Elizabeth I. The children continued with the second part of worksheets near the big world map in the museum. The great map was later used to remake the Francis Drake’s journey around the world. Besides that, children learned about the Tudor fashion, they were also finding differences in pictures with pirates or they tried to find a way out of a labyrinth. After that, children got a chance to run around in the park. 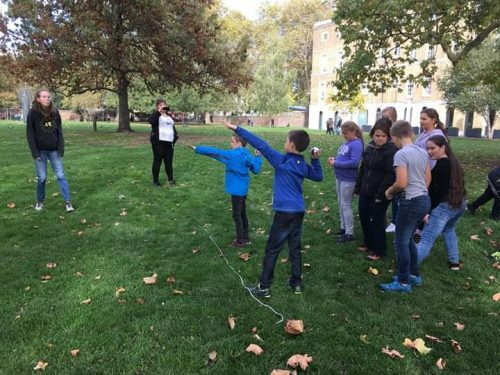 It was followed by an activity where one child from each team was blindfolded and the others had to navigate them to the target using codes they came up with. It was moved even further to finding treasures. In the teams, the kids divided themselves into pairs and they were searching for little gifts they were gathering for the queen as her Corsairs. Finally, we moved onto finding a lost treasure box that contained gifts for everyone. Children successfully found it so they could go home proudly with the gifts and the certificates. 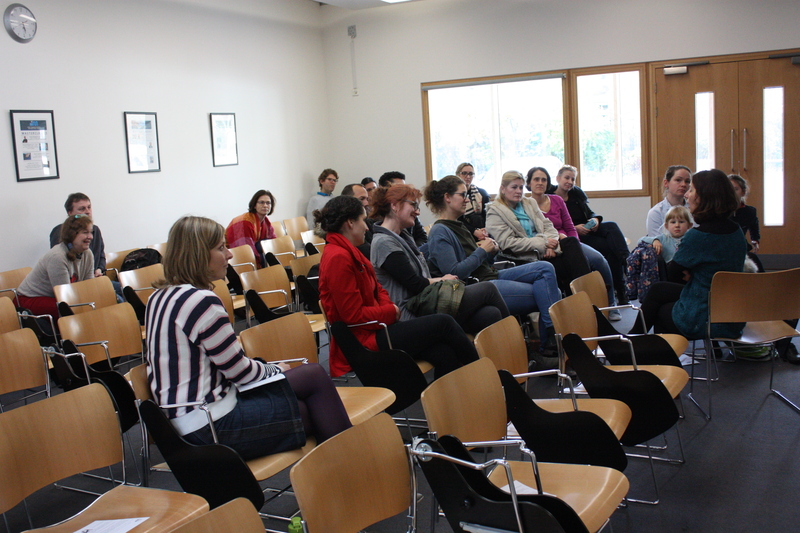 Czech School without Borders, London prepared the whole-day workshop commemorating the centenary of Czechoslovakia. The workshop was held on 23rd October in the Imperial War Museum from 10 to 17:30 for children over 10 years. The very important centenary was remembered by many indoor and outdoor activities. After short warm-up activities children walked around the museum in order to see for example the coding machine enigma or a nuclear shelter from World War II. Before the prepared activities, during the mind mapping, children showed that they know a lot about the Czech Republic and its nature, history, and culture. Then, a short video about the founding of Czechoslovakia and presentation about the most important historical and cultural events of Czechoslovakia since 1918 were prepared for children. This helped them to create a timeline of the Czechoslovakian 100 years represented by a Czech national linden and pictures. Children also made interactive maps showing the territorial changes of the Czech Republic since 1918. In the park, five different sportive activities commemorated the most significant sportsmen and sportswomen of the Czech Republic such as ice hockey player Jaromír Jágr or athlete Roman Šebrle. After that, children started to decode 8 various codes in order to open a mysterious safe. 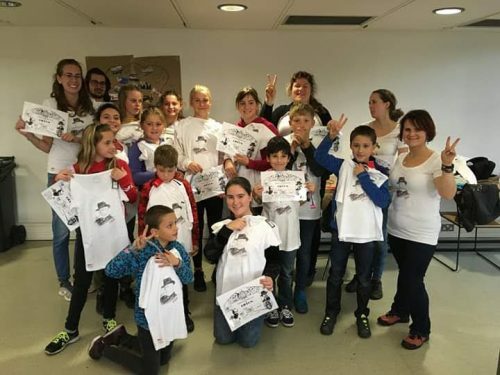 All children were very successful in decoding so thanks to the password DEMOCRACY the safe was opened and everyone was given a T-shirt with the picture of Tomas G. Masaryk – the first Czechoslovakian president. After the last taking of pictures in the new T-shirts children were leaving with great experiences. 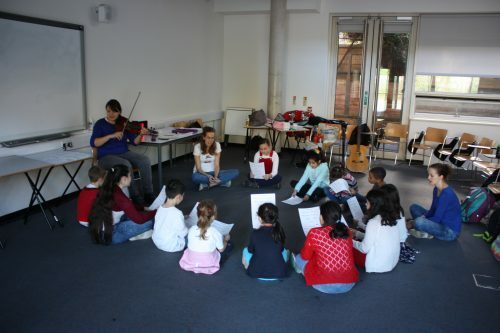 Czech School without Borders, London, offers a new musical lesson for children from 5 years who love to sing and play musical instruments. 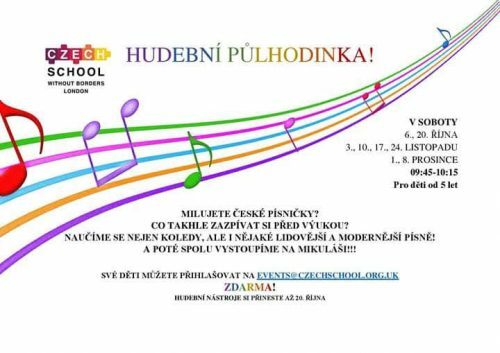 Since 6th October 2018, every Saturday morning before the Czech lessons, children are singing, playing instruments and even sometimes dancing for 30 minutes, from 9:45 to 10:15 in St Mary Academy. Together with trainees Káťa H., Maruška and Kačka N. children learn Czech Christmas songs, folk, and modern songs that are always accompanied by violin, flutes, and guitar. Children can bring their own musical instruments as well! Children are going to show their musical abilities during the happening on 3rd November 2018 where we will commemorate the centenary of Czechoslovakia. Children will sing the favourite song of the first Czechoslovakian president Tomas G. Masaryk called Ach synku. Next time, when you can sing together with children from the musical lesson will be on 8th December. On the occasion of Mikuláš children will sing well-known Czech Christmas songs and a few modern Czech Christmas songs as well. 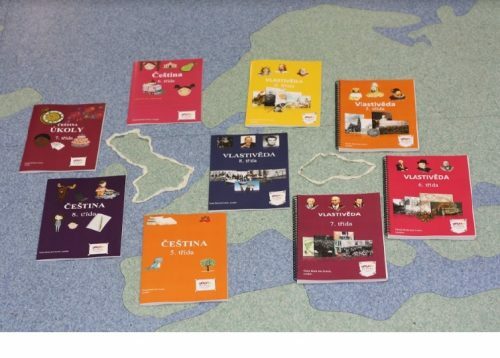 Czech School without Borders London in cooperation with Fraus Publishing are preparing teaching materials, specifically focused on education of Czech-English bilingual children. This textbook not only reflects specific language needs of bilingual children who grow up in a different cultural context but at the same time, it would like to be fun and offer plenty of interesting topic and activities.